We pride ourselves on showcasing some of the best bands from around the Midlands. A diverse range of Rock, Pop, Soul, Motown, Ska, Reggae and R&B performed by skilful musicians and great vocalists. The fun starts at around 9pm every Saturday night, so if you wish to eat, book yourself an early table. Admission is FREE. Other ticketed live music is normally shown in the Ellington Room. First Thursday of every month feature acoustic soloists and duos performing in the bar with an open mic session at the end that anyone can join in with. Keep updated with future events by signing up for our newsletter to keep fully informed. Please note that the entertainment offered or timings may change. Five-piece high quality function band from Northants performing pop, rock, rock n roll, soul and r&b music. Featuring a saxophone player, they cover a diverse repertoire of artists including Beatles, Stones, Kinks, The Monkees, Van Morrison, Billy Joel, Elton John, Elvis, Temptations, Stevie Wonder, Bill Withers, Queen, Roxxy Music, Supergrass, The Undertones, The Clash, Take That, George Michael and Oasis. Come and listen to some exciting live acoustic music featuring various artists with a changing line-up each month. The monthly sessions feature musicians performing cover songs as well as original compositions. Hosted by Hannah Faulkner. Admission free. A four-piece band from Northants performing mainly reggae plus some classic soul and Motown songs Their repertoire includes Bob Marley, Gregory Isaacs, Desmond Decker, Jimmy Cliff, Toots & the Maytals, Sam Cooke, The Drifters, Bill Withers, Wilson Pickett, Ben E King, UB40, The Specials, Sting and The Zutons. A six-piece rock band from Buckingham comprising two female lead vocalists, two guitarists, a bassist and a drummer. They focus on strong vocals and harmonies and combined with a mixture of guitar solos, bass riffs and drum fills, they keep everyone rocking! They perform cover songs by artists including Golden Earring, Stereophonics, U2, Bon Jovi, Tenacious D, Prince, Goo Goo Dolls, White Stripes, The Ataris, Sheryl Crow, Texas, Maroon 5, White Lion and many more. A seven-nine piece party band fronted by 3-4 female singers and one male singer. They perform mainly 60's to 80's classsic upbeat soul, Tamla Motown and funk songs covering artists including Stevie Wonder, Chaka Khan, Earth Wind & Fire, Lionel Richie, Chic, Kool & The Gang, Real Thing, Bill Withers, Heatwave, Odyssey, Randy Crawford, KC & The Sunshine Band, McFadden & Whitehead and more...! An exciting 6 piece soul and Tamla Motown band that get everyone on their feet! Covering material by James Brown, Sam & Dave, Otis Redding, Wilson Pickett, Elvis, Bob Marley and others. Funk Odyssey are a 5-piece band based in Bedford. Their set contains one smash hit after the next and includes various medleys of continuous music to keep everyone on the dancing. Consisting of an exceptional female vocalist and one of the tightest rhythm sections around, they play dance floor fillers from the likes of Donna Summer, Chic, Kool and the Gang, Rose Royce, Randy Crawford, Daft Punk and many others. Professional four-piece band based in Northampton led by singer and bass player Ivor Johnson whose background is rooted in soul and Gospel music. He shares lead vocals with soul singer Kristel Morrison and between them they cover a repertoire of soul, Motown and funk classics by artists including Marvin Gaye, The Temptations, Jackson 5, Stevie Wonder, The Supremes, Isley Brothers, Lionel Richie, Jackie Wilson, Bill Withers, Al Green, Ben E. King, Aretha Franklin, Pharell Williams, Mark Ronson, Dusty Springfield and Duffy. Irene Rae mixes emotional lyrics and a powerful yet delicate vocal with entertaining and funny stories about life, love and places her travels have taken her. She support artists that include Midge Ure, Hazel O'Connor, John Power, The Levellers (acoustic), The Jigantics and Declan Bennett. Irene's style and lyrics have been compared to Norah Jones, Natalie Merchant, Eddi Reader, Lisa Loeb and Bic Runga whilst remaining uniquely her own. Northamptonshire based trio performing classic and modern pop, rock and indie covers. Their repertoire includes artists such as The Killers, Foo Fighters, Snow Patrol, Oasis, Stereophonics, Bruno Mars, Pharrell, James Bay, Coldplay, Eurythmics, Alicia Keys, Black Eyed Peas, Take That, The Who, Republica and Lady Gaga. A five-piece prog rock band based in Milton Keynes who perform the music of 70’s bands including Pink Floyd, Genesis, Led Zeppelin and Barclay James Harvest. A female fronted four-piece band from Northamptonshire who write and perform original songs along with popular cover versions. Material ranges from the 60’s through to the current day and includes genres from blues, rock, pop and reggae. The band’s debut 4 track EP ‘Winter Moon’ was released in 2017 and is available on Spotify, Deezer, iTunes and Amazon Music. King's Gambit are a party-loving contemporary folk band, writing and performing their own original material. The Northampton-based 4-piece feature Chris on Guitar/Vocals accompanied by mandola, bass guitar and cello providing a unique musical offering with a strong beat. A 6 piece party band from Northants covering classic 60's soul, 70's disco music, reggae and pop. A wide variety of music including artists such as Wilson Pickett, The Foundations, Van Morrison, Spencer Davis, Cockney Rebel, Elvis Costello, Marvin Gaye, Bill Withers, Al Green, Stevie Wonder, Average White Band, Doobie Brothers, Bob Marley, Simply Red and Jamiroquai. Great fun! With one of the most solid rhythm sections around the Dogz play soft pop/rock a la The Police, T. Rex and U2, through Van Morrison, Eric Clapton and the blues rock of Cream, through to more current material including numbers from Scissor Sisters, Maroon 5, Coldplay and Kaiser Chiefs. With inspired song writing by Alan Rondeau, five musicians, five harmonies, a mixing of strings, keys and reeds and sometimes a banjo, make magic music. This Northampton based covers band perform all popular Mod and Rock music from the likes of The Jam & The Who all the way to Biffy Clyro & Oasis! Four piece Northampton(ish) based rock band covering popular rock classics with energy and enthusiasm. From Free to Floyd, Killers to Skynard; you will be engaged and entertained, guaranteed! Northamptonshire based Divinity perform the whole spectrum of dance music from the 50's through to present day chart hits as well as classic soul/motown. This has earned them the reputation as an exciting live show with a powerful vocalist and a superb rhythm section. Tracks across their vast and varied repertoire include tunes from Bob Marley and the Wailers, Stevie Wonder, Chic, Jackie Wilson, Jamiroquai and Amy Winehouse. 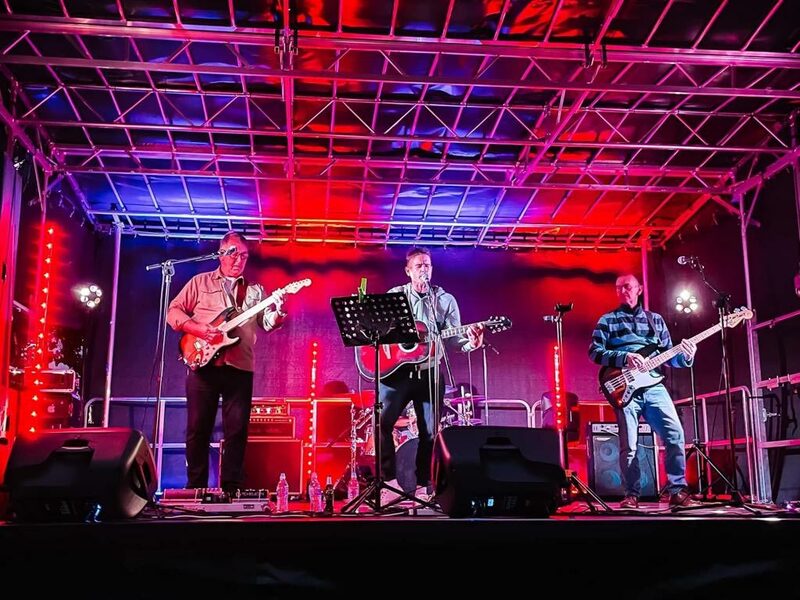 Five-piece classic rock covers band from Milton Keynes led by Ian Anderson on vocals and guitar, Mark Michalski on bass and vocals, Jean-Paul Michalski on drums and featuring guitarists Andy Fenton and Kevin Blake. Their repertoire covers: Thin Lizzy, Guns & Roses, Lynyrd Skynrd, ZZ Top, Deep Purple, Wishbone Ash, Stones, Free, Bad Company, Doobie Brothers and more! Former Pure Genius frontman, Mark Wright and his friends (made up of the UK's finest session musicians between tours). Their set includes tracks by 10cc, Bryan Adams, Mark Bolan, Eagles, Doobie Brothers, Prince, REM, Squeeze, Queen and many, many more. 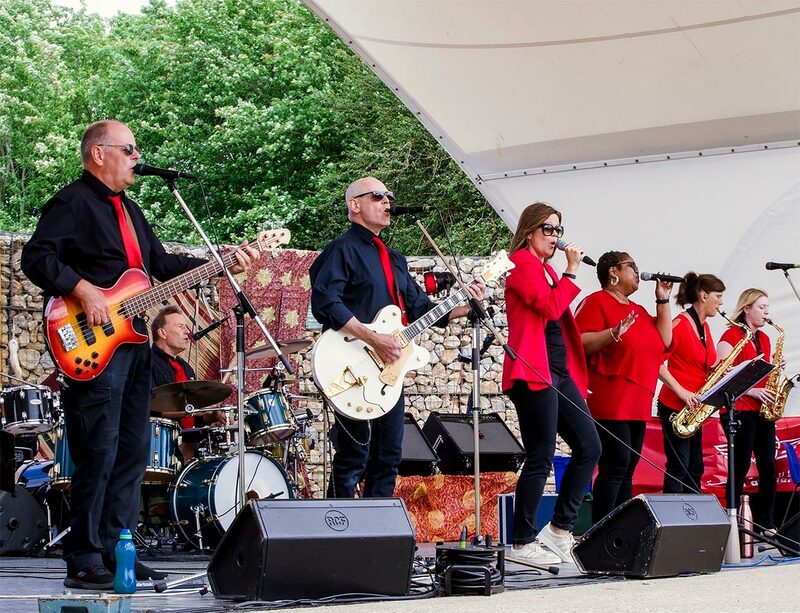 Established over 20 years ago, Soul Fever are a seven-piece classic 60’s and 70’s soul covers band fronted by two female lead vocalists and supported by a brass section and backing vocalists. Their repertoire includes James Brown, Curtis Mayfield, Sam & Dave, Aretha Franklin, Jean Knight, Martha & The Vandellas, Staple Sisters, Wild Cherry, Stevie Wonder, Otis Redding, Al Greene, Heatwave, Solomon Burke, Bob & Earl, Blues Brothers and Bill Withers. 8 Foot Under are an established 70s Rock Tribute power trio, playing the best album tracks and classics from the great 1970’s hard rock monsters including: Led Zeppelin, Jimi Hendrix, ZZ Top, AC/DC, Thin Lizzy, Black Sabbath, Status Quo and The Who. Also included, are a large selection of classics from bands that should have been bigger: Montrose, Budgie, UFO & Rory Gallagher to name but a few. A four-piece band from Northants performing mainly reggae plus some classic soul and Motown songs. Their repertoire includes Bob Marley, Gregory Isaacs, Desmond Decker, Jimmy Cliff, Toots & the Maytals, Sam Cooke, The Drifters, Bill Withers, Wilson Pickett, Ben E King, UB40, The Specials, Sting and The Zutons.